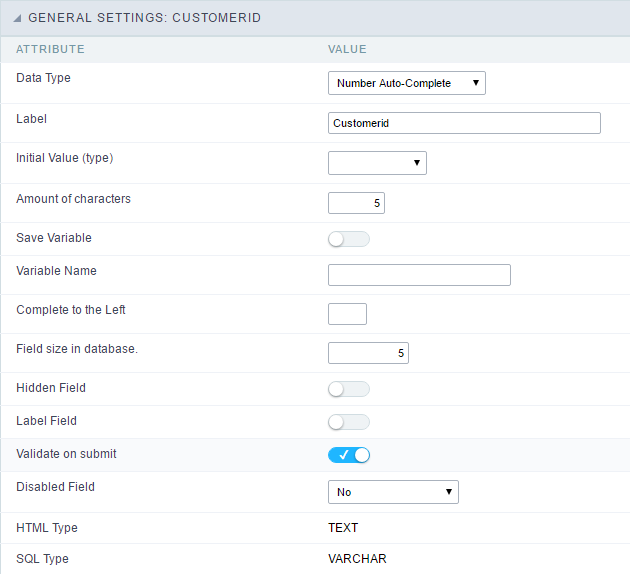 Number auto complete field configuration Interface. Data Type : Define the type of field for the application. When set to Number auto complete, you can inform a value based on the select statement of the lookup settings and it will manipulate an internal number for the data. Defined Value : The field will receive the value from the text field of the defined value option. System Date : The field will receive the current server date. If you select the System Date, then it is not necessary to inform the Initial Value attribute. Initial Value : You will inform the Defined Value here. Save Variable : Allows to save a variable in the session with the value of the field, that can be used in other applications. For example, in the login form the user name can be saved in the session so that it can be displayed on the header of other applications. Variable Name : Allows to define the name for the session variable that will receive the field value. Complete to the Left : Allows to define the character that will be used to complete the value to the left that the user typed in to the max size of the field defined in the Field size in database option. Field size in database : Determines the field size in bytes. It is used to determine the max size of characters that is allowed to type in. 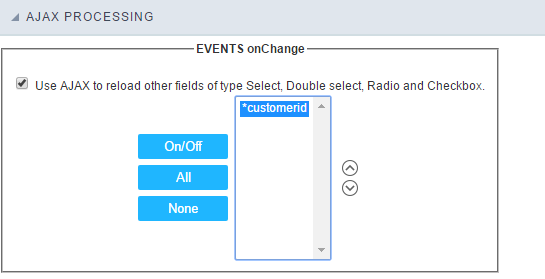 Label Field : This options make the field behave as a Read Only field, not allowing modifications to its value while in Insert or Update Mode. Validate on submit : Validate the field only when the form is submitted. Upper Case : All in Upper Case. Lower Case : All in Lower Case. Capitalize first word : Capitalizes the first letter of the word. Capitalize all words : Capitalizes the first letter of all the words. Minimum Size : Allows to define the minimum amount of characters accepted for the field. 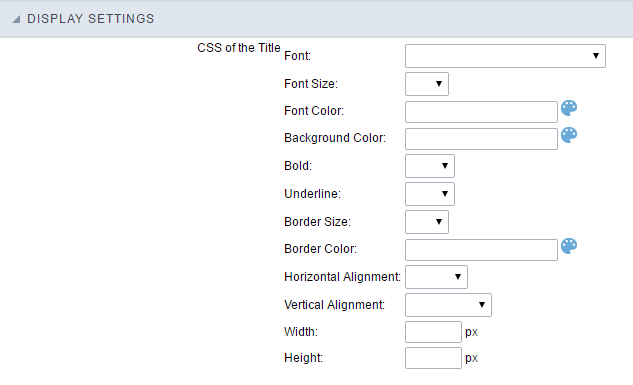 Maximum Size : Allows to define the maximum amount of characters accepted for the field. Selected : Defines a set of characters allowed. Using the configuration below, will be allowed to type letters, numbers and other characters (defined in the attribute More). The letters a, b and c (defined in the Less Attribute) are not allowed. A method used to offer the user a list of values that can be selected in the form applications. For example, the gender field in the Database with the values M or W can be presented like Man or Women or in a dynamic way, having these values recovered from the database. Lookup Settings Display for the field. SQL Select Statement : Define the SQL command that will recover the values that will be displayed on the form field. 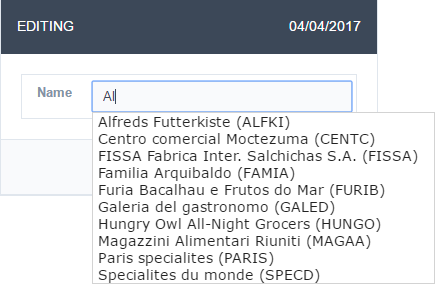 Rows : Allows to define the amount of records displayed in the field. Width : Defines the width the size of capture box (Capture Text). 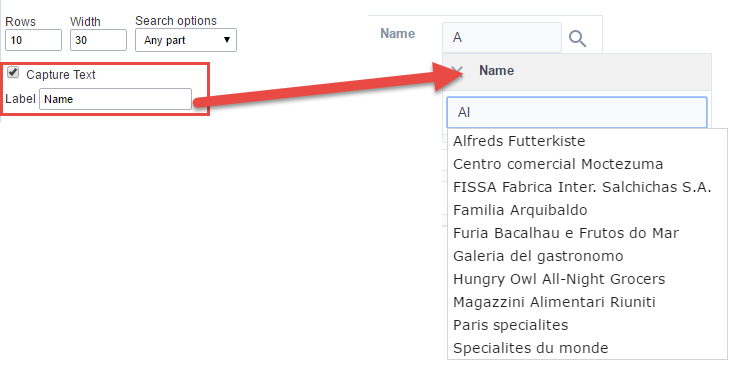 Search options : Allows to define the search settings of the field(Start equal to, Any part and End equals to). Capture Text : When not enabled, you will only view the field to inform the data. See an example below. lookup Settings configuration Interface. Display original and lookup value : Displays the value of the field and the value returned from the lookup. 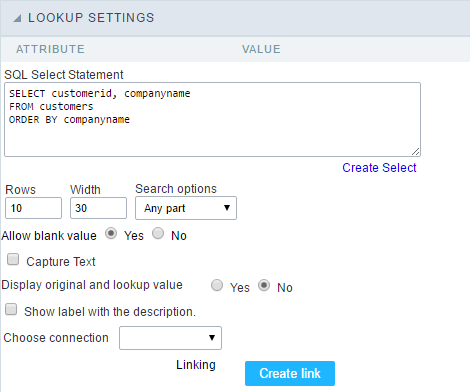 lookup Settings validation configuration Interface. Show label with the description : Displays a label with the description. Choose connection : Allows you to select another specific connection existing in the project. The select command will be done on the second connection. Allows to define the field that will be reloaded when selecting a value that has the (onChange) trigger. For example: a field of the type select with a list of states, and another select field with a list of cities. When selecting a state, the cities list is reloaded.